The Catherine is a new Storksak design launched in 2015 and crafted in luxurious soft leather. The Almond colour is a beautiful neutral shade, versatile enough to complement both your summer and winter wardrobe. 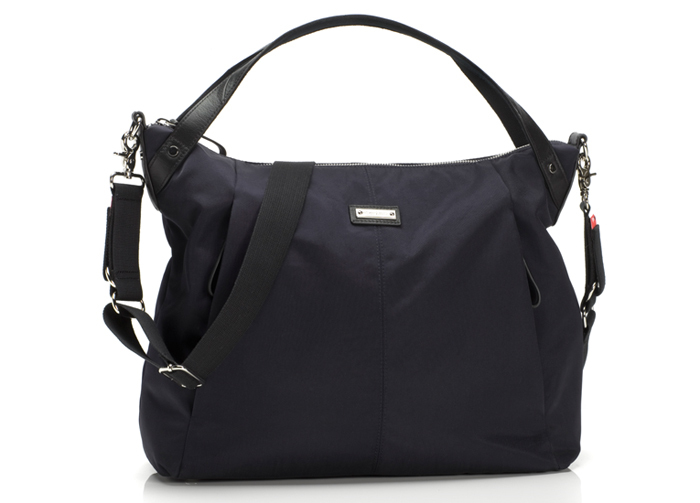 The bag includes a changing mat and handy, attachable pouch with co-coordinating leather trim. The relaxed, slouchy style makes for a perfect everyday bag with a stylish twist. 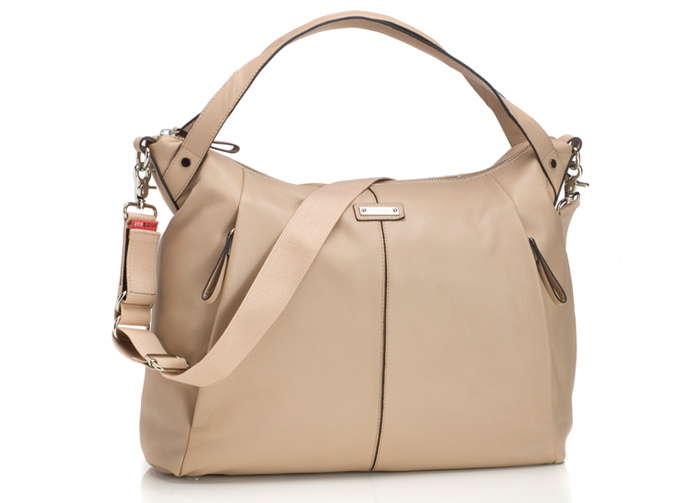 There is a detachable long strap for easy carrying and a padded, comfortable leather shoulder strap. Useful features include two zipped, concealed front pockets and a side insulated bottle pocket. The design is finished off beautifully with shiny silver hardware. The Lara Blue Hospital Gown is a customer favourite. Designed by the talented Gabrielle (former owner of the US labels 1 in the Oven and Mayreau) this gown even appeared the tv series, the Ghost Whisperer. The Storksak FAB (food and bottle) in navy is in a fashionable quilted nylon and is an insulated storage bag for bottles, food, wipes and other wet items. Gaia's Pure Pregnancy Belly Butter is specially formulated to maintain moisture, suppleness and elasticity while your belly is stretching to accommodate your growing baby. 1. How did you feel the moment you found out that you were pregnant? Good luck, entries close midnight 7 May, 2015. 1. Competition closes midnight 7 May 2015 AEST. I felt happy, excited, I cried and was scared all at the same time. At first I felt shock as I had just suffered a horrible miscarriage 2 months before & then it sunk in. An amazing feeling of euphoria and excitement :) I was truly elated! First pregnancy I was really happy and excited, second pregnancy I was very happy and satisfied at the outcome of my careful planning. I felt overjoyed, I felt so lucky to be able to feel carry a bang when is many others couldn't. Millions of emotions but mainly just pure happiness and excitement! I felt overwhelming happiness and excitement coupled with an acute desire to tell everyone I saw that day. Keeping the news to ourselves for the first trimester was the hardest part! I felt absolutely astonished and bemused! After taking 18 months to conceive our daughter, it took only one month to conceive our son! My husband and I had been trying to conceive for so long, when we finally did it took me awhile to believe it! Once it finally sunk in I was the happiest pregnant lady ever. After 4 years of trying I didn't think it could be true! 5 pregnancy tests & I burst into tears with excitement! I couldn't believe it. We'd been trying for a year - my husband wanted me to be calm - I wanted to scream and cry and laugh and jump for joy. Overjoyed, after months of negative tests to finally see that positive! Excited and scared, not to mentioned a little bit shocked?? My husband asked why I was being so moody recently. I did the pregnancy test, which was positive, showed my husband and said that's why! All was forgiven, we are very happy! After loosing our first baby at 5 days old, it took us 8 months to full pregnant again so I was so ecstatic and I couldn't believe my eyes when I did the home pregnancy test! I was full of joy and our family and friends we're so so excited too!!! Incredibly happy, excited and apprehensive. Happy and excited because we were giving our son a sibling, and apprehensive because things haven't worked out before. Only 3 more months to go now! I couldn't believe it at first! After years of trying I felt the happiest and most love for my precious baby. I felt extremely happy and relieved especially after having a miscarriage the previous month and didn't think it would happy so quickly. Just had my 12 week ultrasound and have been told everything looks perfect! When I first found out I was pregnant I felt like the luckiest girl alive, and was so excited to tell my fiancée who was and still is over the moon. Soon our little family will be complete. Feeling totally blessed, excited, overwhelmed to be given such an amazing gift. I was so excited & happy! I was also scared about coping with being a new mum. It was a mixture of relief, excitement and pure joy. After over two years trying and failed IVF we were ecstatic to hear the good news from the clinic. He was born a week a go and we are already besotted. There were too many feelings to describe so readily. Excitement, astounded, scared, LOVE! Becoming a mom is the best thing I have ever done and I am truly blessed! I was speechless & ecstatic!! After 3 years and 6 IVF cycles I was finally pregnant!! Our little boy is now 2 years old and the light of our life!!! I felt confused (what does a faint blue line mean??!) then excited for the opportunity to nurture & guide a little person in this world. I felt super excited, and felt totally blessed that it had finally happened. I was shocked. I had given up hope due to endometriosis. She was a miracle as we weren't even trying! Amazed and excited, didnt quite believe it at first. It was a total surprise! but it was a feeling that I've never felt before, excited and amazed! When I found out I was pregnant, everything felt right. I was overcome with a feeling telling me that this was exactly what I was meant to do. I'd be lying if I didn't say I also felt a little nervous and totally exhilarated! I couldn't wait to tell my partner. It was an amazing feeling that almost compared to the day my little one was born. I went through a roller coaster of mixed emotions, really angry and upset until we heard the heartbeat and then it became so real and now we are very excited and can't wait to meet our baby in 5 more weeks! Finding out a couple days before Christmas, It was the perfect Christmas gift. After a journey to fall pregnant, I was overjoyed and felt so blessed. My nana had recently passed away, she knew how much we wanted to have a baby, so this baby felt like a gift from her. We have recently found out we are having a girl?? I felt like my heart instantly ached to hold my baby and love him.. The moment I found out I was pregnant I felt happy for the first time in 6 months - genuinely happy! It was like the sun finally came out from behind the clouds, I didn't realise how heavy my heart was every day, even when I was "okay". I found out I was pregnant 6 months after we lost our son Kolton who was stillborn at full term. We now have his precious sister here with us, and she is healthy, perfect and so very loved. Pregnancy after loss is incredibly challenging. Back to back pregnancy, with grief and anxiety and many confusing feelings took it's toll on my body and my emotions. But I still remember as clear as anything that day I found out I was pregnant for the second time - my heart sang and my husband and I cried and cried with joy and sadness for the the baby we were carrying in my tummy and for the baby we will always carry in our heart. disbelief and excitement at first, kept checking the line to see if it would disappear, though i know that's not the way they work . Then over-the-moon and scared at the same time!! I was overjoyed. It was 6am and I woke early as I just had an inkling. I took the at home test and couldn't believe my eyes. Just 8 weeks to go and I'm so excited. Confused! Since I had just turned 40, we had struggled to conceive our other three children and certainly were not trying for a fourth. After the initial shock wore off, absolute delight at being blessed with another little miracle ?? I was overjoyed to have a little miracle growing inside of me! After two losses and two beautiful daughters, I still didn't feel like my family was complete. For two years, we tried to conceive without success, and when I turned 40 we decided to stop trying, call it a day , and start looking for a dog for our family. When I found out we were expecting, my husband and I were over the moon. We are so grateful for this chance to be blessed with another child. Pure excitement.... And disbelief - the line was so faint I did another three tests to be sure and then one a day for the rest of week until I could see my GP!! After trying for so many months it felt too good to be true! Disbelief, but also quite nervous, after having had a miscarriage previously and a few scares and didn't want to get too excited. It wasn't unail 12 weeks that I let myself get excited. Shocked, happy and in disbelief. I had been off the pill for less than 48 hours and had been told I would likely have trouble conceiving due to a family history of infertility and my own gynaecological history. My husband was away for three months which is why i stopped the pill...but I got pregnant before he left! I had to Skype him to tell him the good news. Relief, we were one step closer to having the family we dreamed of. I knew I was pregnant, I had pings of unexplainable excitement through my body. We were driving down to Newcastle to celebrate my mums 70th birthday and I wanted to give her the best present I could, the news I was pregnant. But the tests kept coming up negative. Needless to say, a week later I rang her with our wonderful news "I'm pregnant, I'm pregnant, I'm pregnant"! I felt ecstatic and extremely grateful. Joy, love and a great sense of peace came over me when I found out we were expecting baby #3. I truly believe that as a women I am the full circle- within me is the power to create, nuture and transform! I felt very happy but very scared about having a tiny baby again because I am so used to the size and 'robustness' of my 19 month old son! Very happy and relieved, I thought it may take longer to get pregnant again following a previous miscarriage. Love my beautiful baby girl! I felt so incredibly blessed that me and my husband were able to create a life out of the love we share for each other. Seeing the two lines creates a moment of wonder that life will never be the same again. I was in shock! We were just about to start fertility treatment and I felt a bit off so I thought I'd do a pregnancy test just in case! My husband and I laughed hysterically for about 20 mins and it didn't sink in for a week. My fertility specialist now claims that just looking at him can get you pregnant. Our little bundle is now 8 weeks old and I'd do it all again. Bring a mum is so hard and so crazily amazing. Being a mum is all about intense experiences, from the pregnancy to the labour and all the tears, fear, fatigue, love and laughter that comes from a new baby. This is my first Mother's Day and I'm going to enjoy every minute! After many, many negatives and getting our hopes up I started wondering if i should just wait for a pregnancy symptom to tell me a positive might be next. Sure enough as soon as I felt a slight tingling and tenderness I was so excited but nervous...and sure enough a positive! I skipped around the house in utter delight. As my husband wasn't home and I was so excited to share the news I told my little cat that we're going to have our first baby! Of course hubby found out the second he got home and there was more dancing and hugs. Yay! I was away studying and we had only tried once! i was really tired and put it down to study to when i took that test hopped in shower hopped out and there were two lines i had butterflies it was 6 am in the morning i took a photo and sent it to my husband who was 300km away he rang me straight away we were both very excited but i was disappointed we couldn't have cuddled each other and chatted about a bit more! but it is what it is and now we can wait until August ! Initially I was quite nervous and shocked as we have suffered a miscarriage in the past. Discovering we are pregnant again has been very exciting and I feel very blessed to be able to enjoy this amazing experience. After buying so many pregnancy tests that came up negotive when one finally read positive my heart pounded so fast. I trembled with excitement then the tears came and was in complete disbelief as we had been trying with no luck. I ran out to the chemist for 5 more tests just to make sure. Hardest part was feeling all these emotions and having to keep my news to myself for 2 weeks till my partner came home as I wanted to tell him in person at the airport. Longest 2 weeks of my life!! But worth it just to see his reaction. After 2 years of unsuccessful trying, I broke my ankle 4 weeks prior stepping... Ok falling off a wall. The thought hadn't even crossed my mind that I could be pregnant when hubby came home and told me I had to test. I was shocked and excited to finally be pregnant. Thank god I had my walk boot off before morning sickness hit! My life's purpose had suddenly changed course and that I now had a role in shaping the world's future by birthing and raising a new being. Exhilarating but terrifying at the same time! So immensely relieved and grateful. The IVF path is a tough one for many reasons and we're so very thankful we're one of the lucky ones. Disbelief that I was finally pregnant, excited, scared & nervous. Which time? My first: bewildered, amazed and instantly protective to my current and fifth: here we go again!!! I was shocked! I didnt expect those two lines to come up. But once the shock wore off i was soooo excited!!! It felt amazing to know i had a little life growing inside of me! Best feeling EVER! So excited that our little family will be complete. This is our second pregnancy and after a difficult preterm birth and medical issues when our first was a baby and difficulties trying to conceive second time around it was so exciting to finally get a positive test result. It was the most exciting moment of my life so far. I felt so happy and so very lucky. Being the second time that I'm pregnant, I felt just as happy and excited as the first one. I was having trouble with this one trying to get pregnant and when we found out we were just over the moon, we told our little girl and the excitement she showed was priceless. I felt like I had a little secret that I shared with just my tiny baby. Elated and terrified in equal measure! Mixed emotions: Relieved I got pregnant straight away after my GP stated matter-of-factly we should do it NOW because time is not on our side... Apprehensive because I don't feel fit enough to get pregnant yet (was planning to lose weight first and get fit)... But more of thankful and happy because not everyone gets this wonderful experience of motherhood. I felt elated and was overcome with butterflies in my tummy as my organisation instinct kicked in. Our little clan was about to become three and I felt an overwhelming feeling of protectedness and thoughts of what the future will bring! As soon as I found out I was pregnant I laughed. I laughed because I was that excited this was actually happening to me. After 6 months of trying you start to question yourself and I became angry with it all. I couldn't believe this is now all real for us. This is what life is all about. I woke up really early the morning I decided to do a pregnancy test - it was 5am and when I realised it was a positive result I was so excited and giggled to myself. I hardly hesitated before waking my husband up to tell him the good news! First thought was "sheesh, mum was right! That was a lot quicker than expected!" In the words of doctor "it's not possible, surely....". After years of tests, being told that I would have problems & that I didn't ovulate 'anymore, I didn't believe it. 4 pregnancy tests & a blood test just to be sure proved the impossible. I cried. I laughed. I was so nervous, excited, scared & worried all at the same time. I had just done the test in the bathroom and my 15 month old (who had taken almost two years to conceive) had followed me in. This was our first month of trying for our second bub and I was bowled over when the test turned positive. I felt a overwhelming sense of happiness and surprise when I found out and it was special that the little love of my life (my toddler) was with me when I found out. Like Sarah in the bible waiting so long and wanting so much to be a mother. Then complete happiness and joy. A wonderful surprise. My body was telling me I wasn't pregnant but something inside my heart (call it: future mothers intuition) told me I was. I'm glad I followed my heart it's been the happiest news for my husband and I and our families. I felt a peace within. I took a home test and I kept telling myself it's wrong I can't be pregnant, the test is faulty. I cried with my husband in happiness and disbelief. The day The doctor told us I was pregnant with my baby girl is by far one of the happiest moments my life so far. It was until I got sick it became so real. My husband and my baby are the greatest achievements of my life and I cannot wait to show her and teach her about the world. After suffering with Stage 4 endometriosis, trying for so long, and thinking I would never be able to have children, our dreams were finally answered in January 2015. It was the happiest day of my life - I laughed, I smiled, I sobbed. There is no formula of words available in the English language that could possibly describe the joy I felt that day, and upon hearing a doctor's words of, "Congratulations, you're pregnant." Honestly, I didn't believe it was real, I'm 5 months now & are only just feeling emotions because I'm starting to show, we have wanted this & tried for so long it just didn't feel real, I'm scared, excited, happy, & anxious at the same time, I just can't wait to hold this baby in my arms, meet it, feel it's skin & smell it so I will then know it's real & no one can ever take it away from me. Words cannot describe how happy I felt when it sunk in there were two lines on the test. I was in cloud 9 and I couldn't even say much to my husband then, words failed me as I was overwhelmed. Absolutely terrified and incredibly excited, all bundled into one new emotion! Absolutely overjoyed! After having two horribly miscarriages in a row i felt hope again. I was completely shocked and elated - I had just booked an appointment to see a fertility specialist, when my GP rang to let me know that the routine blood test as part of the referral had shown positive HGC levels. A mixture of pure excitement, anxiety and nerves all at the same time! A real blessing. it was our first month off contraceptives. Complete disbelief. Pins and needles in my eyes so that I couldn't focus on the test to see if there really was that second line. Pure joy and all-consuming warmth in every part of my body. Oh what... Oh now... Oh bad timing... Oh well.... Better get another test just to be sure as this one is pretty old.... Oh still pregnant.... Oh.... Right then.... Actually YAAAAAAY! My husband and I only found out on the 24th April that we were expecting. There was a stunned silence, followed by excitement and tears. I was initially really surprised and so took 3 tests just to be sure. Once the blood test confirmed it there were too many emotions - joy, happiness, anxiety and anticipation. I jumped up and down in pure joy and excitement in the bathroom with my toddler. I just can't wait to see her as a big sister. Second time around I was shocked to find myself initially feeling uncertain and apprehensive. And I felt terrible for feeling that way. Then I looked at my beautiful 15 month old son attempting to do the Wiggerly Woo and I felt blessed to have been again given the enormous privilege of being a parent and watching a little person grow and learn. I was a complete shock as I had already had two over the counter tests which were negative but third time round we were lucky! I felt like a new woman and that I was in for a lot more adventures with our new little family that I have always dreamed about. I was excited that I would be raising and teaching my child all I wish that I learned. My unconditional love for my child was instant. Grateful and blessed to begin the journey of motherhood! We'd been hoping and wanting it for a while, so definitely excited but still with a bit of disbelief. I was thrilled, and so pleased that my little girl would be getting a sibling to share her life with. Excited and relieved that after all the heartache we were finally going to be parents! I was shocked and teary but over the moon! Didn't expect to receive such wonderful news so soon. For my first baby, the shock and excitement that we could actually do this! Second baby, the reaction was more sedated but still excited. Third baby (who we are yet to meet!) there was a definite feeling of contentment and belief that this is 'meant to be'. warm and fuzzy :) it's a lovely little secret feeling for those few moments when you are the only one in the world who knows. I was speechless at first! We had only been trying for 1 month so i was shocked when my first test came back positive. We are so excited to be bringing a child into this world, its such an amazing feeling to be able to do such a thing. I feel so so blessed. I waited until my husband got home, and we both looked at the test together. I couldn't believe it, and we both just started crying and shaking - we had only been trying for three months, but it felt like a lifetime. We'd just decided to start trying so I was shocked, disbelieving and a bit excited all at once as I didn't expect it to happen straight away! My hubby was already fast asleep when I did the test, so I told him the next morning and he got pretty excited pretty quickly. I was so surprised! I had prepared myself mentally for falling pregnant to take much longer. Having convinced myself there were so many reasons I wouldn't fall pregnant. To then see the positive test I just had to keep pinching myself (and repeat the test a few times!) to convince myself it was true! Into the second trimester now and it's all very real and exciting! After taking many unsuccessful at home tests I was initially confused upon seeing 2 lines on the test! Then followed disbelief, shock and absolute elation!!!! After trying for five years I was in shock and then felt extremely grateful! We now have a healthy three week old baby boy. So excited and relieved- almost too scared to believe it was real! We had been trying and had a message left on my phone from the doctor suspecting an ectopic pregnancy after some testing I had done and he told me to go to the hospital. After a very scary and teary few hours there, we discovered I was actually just pregnant, there had just been lots of confusion over my ovulation and timing of results! It was such a relief after thinking something so terrible to hearing the best news in the world:) I went to 2 more doctors the next day just to make sure! I was in shock after trying for so long and being pregnant for the first time in my 40s! My husband was away for work so it took some time to be able to tell him and my mum but it was a surreal and exciting moment ! I was working in NYC and thought I had really bad jet lag for the whole two week assignment, yet had no interest in my beloved coffee to lift me from my sleepy fog. On the flight home I slept uninterrupted for eight hours, waking to an insatiable hunger that had me irrationally warn the poor flight attendants something bad was going to happen if I didn't get a meal! (Think Kristen Wiig in Bridesmaids and you get the idea!) Then the 'travel sickness' started, and it just didn't stop. My husband insisted on a pregnancy test and we were thrilled to learn there was a reason behind my crazy sleeping and even crazier outburst, and that we had our first 'impossible' baby to look forward to. I should add, I once accidentally poisoned the cat (thankfully he lived and is rubbing around my ankles as we speak), so fear about caring for a human may have crept in there too! We're now excitedly hoping for a Mother's Day delivery! Its hard to identify one feeling as when I found out I was having my first after 3 years of trying I was surprised, excited, emotional, shocked, over the moon, teary, ecstatic, elated, amazed, nervous, shaken, stunned, overjoyed, flabbergasted! - all these and so many more rolled into one! No one can every prepare you for the feeling of finding out you are growing a tiny human! As he will be my first, I was equally terrified and excited. I just had a feeling, so I did a test without saying anything to my husband and it was positive. The best part though, was seeing my husbands face when I passed him the test and he realised what it meant. His smile and eyes welling up, was the sweetest moment I've had with him apart from when we said our vows. Now, I can't wait to see him when we meet our little man in August. Surprised that it happened so quickly. I waited 2 days and done a few more tests before telling my husband as I was in disbelief. After telling my husband his face was priceless, even having the nerve commenting how moody I had been lately! It all became a wonderful reality that we'll be bringing a beautiful baby into the world that is a creation of me and my husband. Fourth pregnancy, unplanned and just turned 40...to see the two lines on the stick was the biggest shock and a roller coaster of emotions. It started out as dread and despair, but over the course of the last 15 weeks, with the help of my 3 little boys, has turned into one of the most fun, exciting and biggest blessings any woman can have. A combination of happy, excited and thankful but also nervous as I had had a miscarriage the first time around. Happy and relieved that there was a reason for the sudden bra explosion! An overwhelming feeling of love for my husband and our little baby. It was the weekend of Valentine's Day this year, it was prefect and such a precious memory to have as we begin our journey as a new family. It was strange. As I did not want to get too excited. My motto has been to take each moment as it comes without getting overly excited but being grateful for each moment as they go by. When I found out I was pregnant I was in disbelief. Could it really be, that the IVF had finally worked?! After so much disappointment and several failed attempts, it took a few days for the news to sink in, to be honest. I was beyond thrilled! We tested 4 days early, so I was fully prepared for the test to be negative. My husband couldn't believe I had the control to wait 2 hours before telling my parents. Disbelief at first (it took nearly 2yrs), very blessed, but I was so irrational and consumed by fear that something would go wrong. So far so good and I'm now able to share our great news. I still feel so very fortunate. Excited and nervous. Trying to keep emotions at bay until first trimester passed! The biggest smile ear to ear, overjoyed, couldn't believe it as I had been taking fertility drugs for months and just really couldn't believe it!! Didn't expect it and couldn't take the grin off my face!! An unforgettable moment and I hope to experience it again! Super, super excited both times!!! More emotional the first than the second, but equally happy to find out with both. Can't wait to meet my little girl in September! i didn't believe it, we had wanted it for so long that when the digital pregnancy text showed a plus sign ('+') i read it as a cross ('x') thinking it was a negative reading. i waited for my husband to wake up before showing him...then the moment came, and he just laughed at me and said "oh baby, its a plus sign. your pregnant!" We had just flown into Stockholm for a much needed holiday, but now it was the cleanest holiday ever, I celebrated with a soda and cranberry! The moment those two little lines appeared on the pregnancy test time stood still. I can remember that feeling to this day, that intense euphoric, joyous state, where it just doesn't quite seem real and you need to pinch yourself to make sure you aren't dreaming. All my wishes had finally come true and I was carrying a tiny little person inside of me. I still get that overwhelmingly tremendous feeling of love when I look at this precious, perfect human I have created! This time around, my third, I was feeling all 'I told you so'. I knew that I was pregnant and my other half did not believe me. I tested while we were on holidays in NZ and those two pink lines came up straight away! Yay! It felt right, and so strange and exciting and scary, all at the same time. A completely indescribable feeling! When i first found out i was pregnant i had tears of joy, i couldn't describe how i felt because i just kept absorbing all the good thoughts, i was also making myself beautiful, i was pampering myself and i was always surrounding myself with people who are positive thinkers. There is nothing more rewarding than knowing there is a little one growing inside your body, after waiting for this miracle for months and months! It wasn't planned but when I started to suspect I was pregnant, I felt as if I had secretly wished for this and now it was happening, I felt blessed. Very emotional, Ecstatic, over the moon and truly blessed to being carrying such precious cargo. When I saw those 2 lines on the test I didn't believe it so quickly went down the road to the little chemist and bought 4 more tests to double check and my hubby was saying yes they are fefinitely positive when we compared them to the image on the info booklet. I didn't believe the results! A mixture of crazy excitement and disbelief, my husband and I had been trying for 8 months, I'm my late 20's and so many of my friends conceived with in the first 3 months so I was thinking there might be something wrong with me. And when I saw the words positive I was so happy I ran out to tell my husband straight away, I think he was in a little disbelief too, he had a smile on his face, but kept fairly quite... I wonder what was going through his mind. We found out we were pregnant with our first baby 2 weeks after we got married... we were both terrified and then over the moon. I am now 4 months pregnant with our second child and this time when I found out my overwhelming feeling was one of absolute delight and joy. The second time was almost more special as you know what you are in for - the most amazing thing you will ever do! Complete elation and an all consuming sense of wonderment at the prospect of becoming a mother. I felt ELATED the moment I found out I was pregnant! I have always wanted to have children and I was at an age where I was hoping to get pregnant as soon as possible and luckily for my husband and I, it all happened quite quickly. I have a step-daughter which I love and care for but I was hoping to have children of my own and at my 12 week scan I was not only told that I was blessed with one child but with two! My twins are now 9 months old and I cannot imagine life any other way. Overwhelmed, and then over joyed. And then an enormous feeling of gratitude. When I first saw the positive pregnancy test my heart skipped a beat and I didn't initially believe it. That was quickly replaced by feelings of gratefulness that I could start a family, and impatience for the little guy to get bigger so I could meet him! The 1st time (after 3yrs...) was of pure excitement, of being on cloud nine, not believing but believing of course I'm pregnant! The 2nd time (after a miscarriage) was of uncertainty, hoping that all would be ok.. And it was ?? my first thought was pure fear. I will have a 20mth old and a new baby.....what am I going to do!!!!! Lol. I'm super excited, but still super nervous. Shocked and excited simultaneously. We were very blessed to have only been trying for 2 months hence my shock at how quickly we fell pregnant. I really thought it wouldn't be positive, such a happy day! I was in stunned paralysed blissful shock! It was hard for me to believe. I am nearly 38 and my husband and I have been trying for a number of years now. Whilst we were still very hopeful in our 'trying' I was so used to it not happening that when I was 2 days overdue I only took the home pregnancy test to confirm I wasnt - just so I could stop thinking about it! I never thought it was going to show up positive - which it did??. I had to call my husband right away - once I got my feet and hands moving again. He was away working and was up in a boom lift at the time - thankfully he was holding on when I told him the news! Can't describe how happy and excited and lucky we feel! Very very shocked and surprised! Having a 9 month old already, the memories of a newborn were very fresh and scary still! The moment I found out I was pregnant I felt so special and honoured. The disbelief and surreal euphoria wiped over me in a sort of outer body experience! "Is this truly happening to me! ", I kept thinking. My husband and I shed tears of joy as we fell into each other's arms. To see how happy my husband was made my heart melt. I knew it would be a moment I would never forget. The moment I found out I was pregnant, I was soooo happy! It was an answered prayer, the most beautiful blessing..
i was shocked, happy and freaked out all at the same Time. It's been such an amazing experience and I never knew I'd love being a mum this much! Relief as I thought I was just feeling run down from dealing with recent car accident, extra demands from work and trying to make the Christmas period memorable for our 2 year old. Surprise as it didn’t cross my mind that I would be pregnant as we had only recently starting trying for number 2. Excitement as it was Christmas Day and I now had the perfect present for hubby that would leave him speechless. When I officially found out that I was pregnant I was in awe! My husband and I were worried we couldn't conceive a baby since we tried twice with ovulation tests and had cruise 3 years expecting it to just happen but on Halloween 2014 we got our blessing. That mornign my Husband was left in tears as I took 3 breaths and told him "We did it" It has been a roller-coaster from here on but loving the experience. I was seeing a specialist about a lump in my breast (non benign) when she asked me if there was any chance I could be pregnant. I laughed at her. When I got home I did a test just in case. It was positive. I was in total shock, then I cried with happiness. Since the announcement was made that a royal baby would be born in mid-2013, almost global excitement has preceded the birth of the heir to the British throne. Of course, just as much (if not more excitement) has been generated over The Duchess of Cambridge’s pregnancy, including: her maternity wear, health and plans for the royal baby. The media is flooded with speculation about the birth and the baby, where the royal baby and its parents will live and how Kate is fairing throughout the trimesters of pregnancy. Current chatter about the royal baby is rife and recent stories have focused on the chic mother-to-be’s pregnancy fashion choices, the precise due date, where and how the baby will be born and, of course, whether the new royal heir will be male or female.